Tony Romo had a lot on his plate as the Dallas Cowboys starting quarterback this season. His increased role during weekly game-planning and his ability to change plays at the line of scrimmage gave him more responsibility than most NFL quarterbacks. 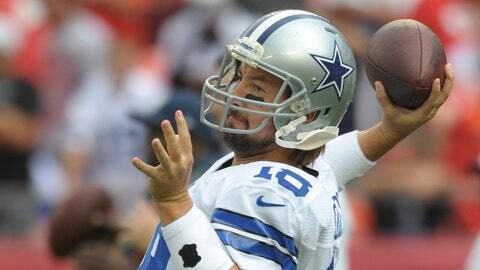 With Romo done for the season after undergoing Friday morning back surgery, Kyle Orton steps into the starting QB spot. Cowboys owner and general manager Jerry Jones said Friday that Orton will not have the same freedom as Romo did when it comes to switching out of plays before the snap. "It’ll be different," Jones said on 105.3 The Fan [KRLD-FM]. "No. It’s different. Tony was so involved in the makeup of the game plan this year, so involved in what we were offensively. Several parts of it tailored to the kinds of things that he does the best and wants to do the best. It’ll be different. On the other hand, it will be very, very good in my mind. The good thing about Orton is that he understands this philosophy of I would say, for lack of a better term, Jason [Garrett’s] offense. He understands what’s expected from it. "He can read it well, he’s got a strong arm and he’s got a lot of experience. From that standpoint, he’ll be very friendly to this offense and this offense will be friendly to him." Orton has started 69 games in his nine-year career but has only attempted 15 passes over the last two seasons with the Cowboys.